This kid is doing crazy things! Here I was, sitting at work a couple days ago, and this is how he decided to position himself. When I say, "position", I mean kicking and squirming around. He is so active these days. I’ve started taking video of the movements too. 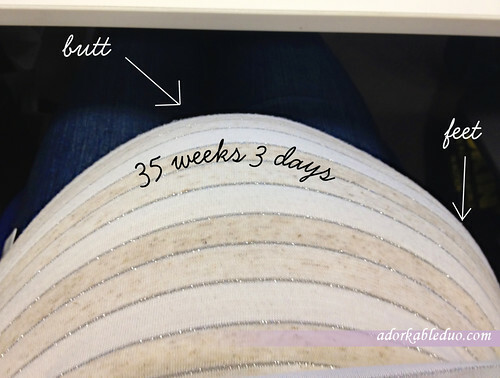 Before I was pregnant, I had no idea that mothers’ tummies moved around so much that you could see from the outside. It’s like a scene from Alien. I’m officially 36 weeks, or 9 months pregnant now. Four more weeks to go until my due date. Everyone has been saying that I won’t make it that long. We’ll see!